If you’re wanting to straighten your teeth, you’re not limited to unsightly metal braces anymore. Your options have grown tremendously in the past several years, making way for a revolutionary orthodontic treatment: Invisalign in Bonita Springs. Pelican Landing Dental is here to help you determine if Invisalign is the right choice for you. The Invisalign clear aligner system is a new and discreet alternative to traditional braces. You won’t have to worry about embarrassing metal in your mouth. 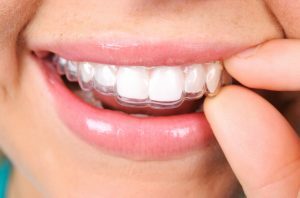 Instead, you will use several sets of smooth, aesthetically pleasing, clear, removable plastic aligner trays. These trays are customized to each patient’s teeth to reach their individual smile goals. By switching them out every few weeks to the next tray in sequence, the aligners will gently create incremental changes to the position of your teeth over time. Before you know it, your teeth will be straightened to their correct positions! Am I a suitable candidate for Invisalign? Teeth free of tooth decay and damage. Commitment to good, long-term oral health. The desire to fix crooked teeth, gapped teeth, and or crowded teeth. Self-discipline to wear their aligners for at least 22 hours a day. How do I go about getting Invisalign? So, you’re still interested? Getting Invisalign may be easier than you think. It only takes 3 simple steps to start straightening your teeth. Meet with your cosmetic dentist in Bonita Springs for an open-minded, informative consultation. If Invisalign is right for you, impressions of your teeth will be made and photographs will be taken of your smile. The information will be sent to the technicians at an Invisalign lab along with your dentist’s instructions for tooth movement. Within a week or so, your custom Invisalign aligners will be sent back to Pelican Landing Dental. Our dental professionals will instruct you on how long to wear each custom tray for and how to care for them properly. Are you unhappy with your current smile? It doesn’t have to be that way forever. Crooked teeth, rotated, or misaligned teeth can be corrected to get you the smile you’ve been desiring. All you have to do is contact our friendly office to embark on your journey to straight teeth. Even if Invisalign isn’t perfect for you, we have other orthodontic treatments that may fit your dental needs and lifestyle. Give us a call today!